The first wave of “finishing touches” are being applied to the Mud Hollow Field projects as the new school year draws ever closer. 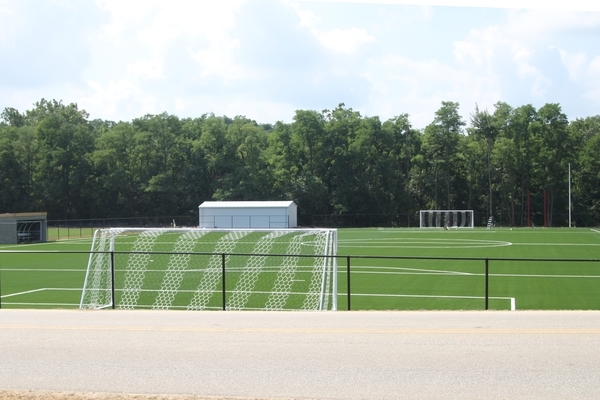 With the installation of the FieldTurf Duraspine Pro at the soccer stadium completed and sod filling most of the new practice and intramural/recreation space at Mud Hollow, the major focus of the project now turns to a long list of smaller items that will provide the final detail to the construction. 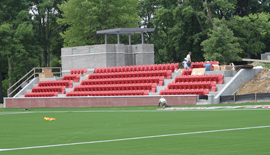 New goals and team benches were completed early this week and will be waiting for the arrival of the 2011 Wabash soccer team for early season practice in few weeks. Actually, the nets got some early work when senior players Ian Kelly and Mike Hegeman took some of their lunch break from summer campus jobs to kick around on the field on a warm Tuesday afternoon. You can view photos from their impromptu practice session along with some of the other project items here. Seniors Ian Kelly (left) and Mike Hegeman kick the ball around at the new soccer stadium during their lunch break. The new scoreboard will installed the first week of August, with handrails and fencing to go up around the facility during that time, as well. Everything is on schedule to be ready when the stadium gets its first real shakedown on Sunday, August 28 when the Little Giant soccer team scrimmages against St. Joseph’s College of Indiana at 5 p.m. 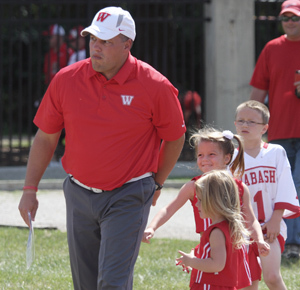 The first official match at Mud Hollow Stadium will take place on Saturday, September 3 when Wabash plays Trine University at 2 p.m. in the opening match of the Second Annual Robbie Dreher Classic. 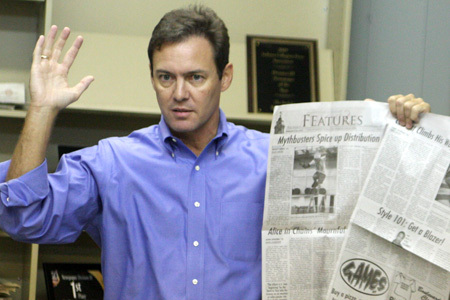 Steve Charles—For decades now, TIME Latin America Bureau Chief Tim Padgett ’84 has been American journalism’s voice crying out in the wilderness, warning us to pay attention to events in and the people of Latin America. So when I saw the cover story for the July 11 issue of TIME and read the headline—“The War Next Door”—I should have known there was only one person TIME would trust to get that story right. 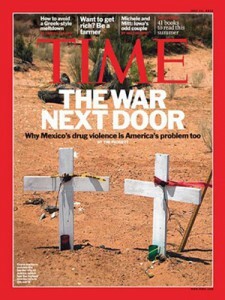 Even the subhead—“Why Mexico’s Drug Violence is America’s Problem too”— sounded much like the title of a talk Tim might give to students and faculty at Wabash. Journalist and teacher—Padgett took time to work with the writers and editors of The Bachelor during his 2009 visit to Wabash. “They wanted an essay that would put more of a human face on the drug war for a change, so it felt good to get these people’s stories out this way,” Tim responded after I wrote him to congratulate him on the piece. Not to mention a worthy exemplar of the power of a liberal arts education. Read an interview with Tim here. Brent Harris — Work has continued throughout the warm Indiana weather over the past few days. The crew from FieldTurf have nearly completed the installation of the DuraSpine Pro surface at the soccer stadium and have the surface ready for play. Crews have added the new seats and will complete the final stages of the stadium over the next few weeks. View the latest photos from the Mud Hollow project here. Most of the attention will now turn to the practice fields and track and field competition areas on the eastern portion of Mud Hollow Field. 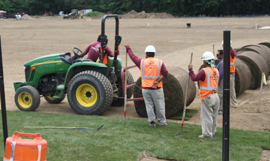 Landscapers were laying the first sections of sod on Wednesday, and plan to have a entire green field in place by the weekend. With the new sod in place, crews were working on the irrigation system to make certain there will be no problems keeping the fields watered as the new grass takes root. Fencing will be added in the coming weeks, along with some final pathways and landscaping, getting everything buttoned up for the debut and dedication of the new facilities in late August. Raeburn with his children before a game last fall. – Little Giant Football Coach Erik Raeburn is in Austria with the U.S. Mens National football team. The Div. I, II, and III players spent last week on the Wabash campus for their training camp. Check out the story and video here from the USA Football website on Coach Raeburn. Be sure to watch the video for great footage from practice on the Wabash campus. Click here for a story about Raeburn being named to the coaching staff. Here is a link to the official Austria 2011 Football championship homepage. The Little Giant coach is using his Twitter account to provide regular updates while the team competes in Austria. Follow Coach Raeburn on Twitter.